Gaia-Wind manufactures wind turbines for light industrial, agricultural, commercial, municipal and residential use. Clients include working farms, educational institutions, large home owners, offices and other commercial premises. Gaia-Wind wind turbines incorporate over 20 years of Danish wind industry design experience and offer the performance and safety features that are usually only found in larger, utility scale turbines. The oversized rotor design allows the turbine to deliver up to 80% more energy than other similarly rated equipment, enhancing project economics and maximizing the return on your investment, whilst ensuring optimum performance in low to moderate wind speed regimes (10-12mph). A Gaia-Wind turbine generating around 30,000 kWh of green electricity per year, will offset around 17 tonnes of CO2 emissions from existing energy generation. This is sufficient to bring the carbon footprint of the average four person household back to zero (household energy use + car + air travel). 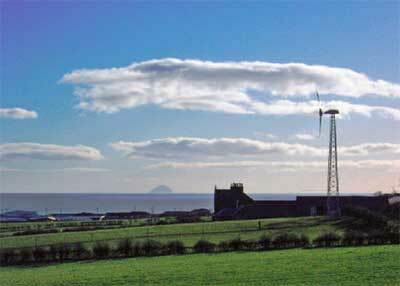 Middlepart Farm is a working farm with stables and holiday cottage based in Ayrshire, Scotland. The owner of Middlepart Farm, Mr Bronte-Stewart, wanted to reduce his energy bills by generating electricity from a renewable source to supply the main house, holiday cottage and stable yard. The Gaia Wind 133-11kw Turbine was chosen based on its performance credentials from a shortlist of 3 other small wind turbines. The site is a moderate wind speed site in open farmland. The turbine is sited next to the farm on a gentle slope facing the prevailing south westerly winds. The turbine produced an impressive 36,042 kWh (units) over the first year, giving a daily average of around 100 kWh. At this level of production Mr. Bronte-Stewart was able to substantially reduce his energy bills, as well as sell surplus electricity to the grid and benefit from an income through the government carbon credits scheme (ROCs).